Thank you, everyone! I'm really hoping it's tonight. I'm not sure I have another night of this in me. Hubby just took watch while I ate dinner. I have literally been sitting vigil since 4pm. 5 hours and that's just tonight. I'm beat. My last ditch effort to get her to the pools was to place the flashlight overtop the pool, shining into the water as encouragement. Like the shine of the moon that baby sea turtles follow after hatching. No dice. She fled back into the back corner behind the rock sculpture. I give up. I got nothin' left. I really hope she makes it to the SW pool when she drops. I REALLY do. If she does, I've got a sweet setup all prepared for her babies and everything I could think of to give them the best start I have in me. If not, c'est la vie. Good luck Garbo. Good luck nature. See you in the morning. I know its hard but you have out her in the best environment to hopefully drop her babies. Im sure once she and her eggs are ready she will do it. So hopefully tomorrow brings cloudy water! Oh, and in case you are wondering, that purple thing hanging on the side above the SW pool is their hamster wheel. I modified it with craft mesh to make it wider and more grippy. They love it, fight over it, guard it, and walk miles and miles in it. And the SW pool was much bigger and deeper but I made it shallower for Garbo with a more sloping entry as the old one seemed to freak her out--like everything does. Poor skittish Garbo. You are dedicated mlakers! I was chuckling reading your texts, because I know I would be doing the same thing if I was in your shoes! We are all rooting for you & Garbo! If it's meant to be it will happen! You have been so dedicated and diligent- it's very exciting to be a part of...thank you for sharing! Now...I'd really love to know about this wheel too! Lol . Get some rest! We are all rooting for your success!!! "Judge a man not by his answers, but by his questions." Thank you for keeping us updated! I'm hoping it all turns out! Even if it doesn't this time though I'm sure there will be more opportunities, and at least you have a nice set up for babies regardless, so you will always be prepared. Thanks, everyone. She appears to still have the eggs this morning, based on her behavior, not a visual confirmation. She is acting clearly uncomfortable and the eggs appeared quite dark yesterday. I rarely interfere with my crabs, but I am considering gently setting her in the shallow saltwater pool I made for her if she hasn't spawned by noon. Inducing, if you will. I witnessed her mating, I know exactly how long it's been (50 days today) and they may not even be viable anymore, anyway. We shall see. I'll let her behavior guide my ultimate decision, but if the opportunity arises, I may take it. mlakers wrote: Thanks, everyone. She appears to still have the eggs this morning, based on her behavior, not a visual confirmation. She is acting clearly uncomfortable and the eggs appeared quite dark yesterday. I rarely interfere with my crabs, but I am considering gently setting her in the shallow saltwater pool I made for her if she hasn't spawned by noon. Inducing, if you will. I witnessed her mating, I know exactly how long it's been (50 days today) and they may not even be viable anymore, anyway. We shall see. I'll let her behavior guide my ultimate decision, but if the opportunity arises, I may take it. Same thing with breeding fish(which is where I have years of experience)... They know what to do, so leave them be. Sometimes things go wrong, but if they are happy enough in your care to mate once, they'll mate again and again. Thanks @Paradi. I really appreciate the input. I'm still on the fence, still waiting to see how she looks when she reemerges today. I did refresh the SW pool so hopefully it's nice and inviting. She just looked so terribly uncomfortable last night, hanging out, shifting around, lethargic (or maybe that was me! ), and I haven't seen her eat for days. But you are probably right, they will follow their natural instincts. I am generally a non-interventionist but I'm having trouble not obsessing over this one for some reason. Probably because I've put so much work into getting everything ready--a fact about which my crabs cares exactly zero. I agree with Paradi & Just Jay also! Garbo knows what she is doing. Try practicing some diaphragmatic breathing to relax! You are just anxious and excited like us! Become distracted and tell us about your hamster wheel! Lol . (Please!). I'm oh so very curios! 99% sure the eggs are gone. Garbo is now eating, climbing, even walking in the wheel. She went from being basically catatonic yesterday, hardly moving, hanging half out of her shell, and shifting uncomfortably to being more lively than normal. Last night was it, I was pretty sure, based on her behavior. It's why I hung on for five hours waiting. If I had it to do over again, I would have gently set her in the saltwater before giving up, just to see if we could save any. 50 days is too long a gestation. 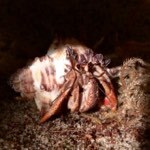 I'm sorry, hopefully you'll get another chance again since your crabs are comfortable enough in your tank to breed. Maybe by the time it starts to happen again you'll have time to get ahold of any other things you may want for trying to raise the zoea. 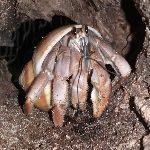 Remember, having the crabs comfortable enough to attempt reproduction is a feat itself considering how hard crab care can be.